Grain Berry Multi-Bran Flakes combine powerful health benefits with great taste to make breakfast your best meal of the day. 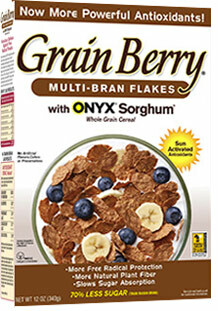 We start with Whole Grain wheat and wheat bran; then add a proprietary blend of the ancient grain sorghum, including unique Onyx Sorghum. That’s where all the potent healthful benefits come from. Now about the great taste. Even though we use 70% less sugar, 40% less sodium, and no artificial flavors, colors or preservatives, you’ll be delighted that all that good nutrition doesn’t compromise the great flavor of wholesome grains. Enjoy a strong start to you and your family’s day with Grain Berry Multi-Bran Flakes.